Chinese New Year starts today, and this year, 2018, starts the Year of the Dog. These two wonderful new picture books celebrate aspects of the Chinese New Year. This wonderful retelling of the Hans Christian Andersen tale politicises the fairy tale, while also inverting the identity of the hero of the story. Whilst the hero is still a small boy in this version, he is also the emperor himself. Rosy-cheeked little Ming Da becomes emperor of China at the young age of nine. But because he is so young, the ministers and advisers around him take advantage of him and steal from the treasury for their own gains. Soon, Ming Da’s kingdom is poor – the people can’t afford to dress, or buy food, but Ming Da is scared that the corrupt ministers will take over if he simply fires them. 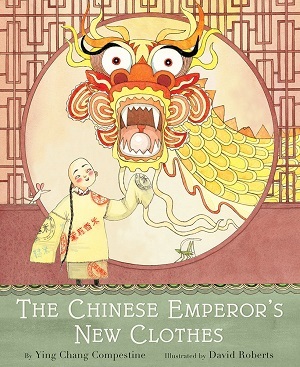 With the help of his tailors, the boy emperor concocts a plan, and for the Chinese New Year parade, when traditionally people have dressed in new clothes so that evil spirits won’t recognise them, he tricks his ministers into wearing rice sacks and believing that the sacks are enchanted, and actually appear as the finest garments in the world. A boy in the crowd does pipe up and shame them, but it is the emperor who has the last laugh, seeing his ministers flee in humiliation, enabling him to restore the riches to his people. Compestine has bravely taken the origins of the tale together with a folklore element, and twisted them neatly to suit her purpose. In fact, she grew up in poverty during the Chinese Cultural Revolution, where food was scarce and Western folk and fairy tales banned. Her book zings with both righteousness in the morality of the tale, but also in its new cultural identity and contemporary storytelling. David Roberts has created vivid, mesmerising artworks to match the tale, with colour vibrancy pared down so that the colour lives in the detail of the illustrations – the patterns of the silk robes, the intricate designs of ancient China. There is a clever switching too between full page framed illustrations and those that live in free space surrounded by white background. The subtle colouring indicates a light touch, but also lets light onto the beautiful details of the expressive faces, as well as the sweet insertion of an observing mouse on each page. There is a guide to making your own Chinese New Year Parade robe at the back. You can buy it here. 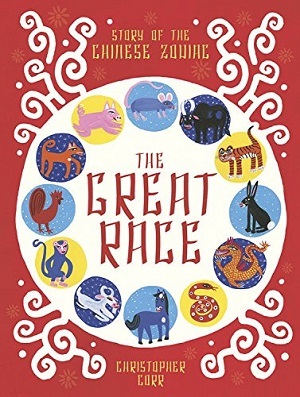 A complete contrast in the illustrations here, in which Corr uses his book to explain how the Chinese zodiac came to be. There is colour vibrancy from the outset, and illustrations that take on a looser, less geometric styling than Roberts’ above, but which still carry a fair amount of detail, and feel authentically Chinese, well-researched and lively. The story begins before the delineation of time, in ancient China when the Jade Emperor decided that he wanted to be able to calculate how old he was, and thus there must be a way of measuring time. The Great Race begins. The emperor decrees that the first twelve animals to cross the river will have a year named after them. The animals’ personalities come out in their method of crossing, from the rat who is devious to the lucky rabbit. Some of the animals even take to teamwork to get across. This is such an appealing picturebook. 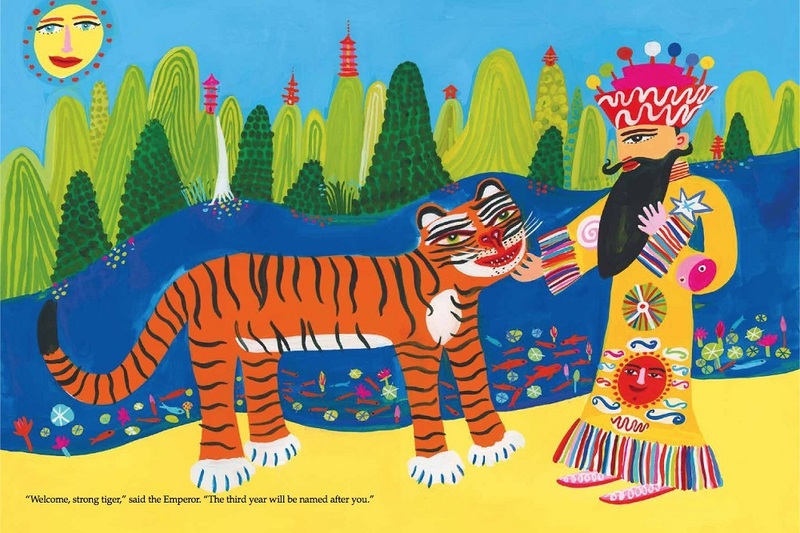 An old folktale told in contemporary language, with breathtakingly colourful images – the picture of Emperor Jade welcoming the tiger across is particularly bright and evocative. All the animals are ‘male’, which again reiterates the debate made in the Guardian last month, but this may be a nod to how the story was always traditionally told. However, as Compestine has shown above, twisting a tale is perhaps what’s now due. Despite the male dominance in both books, these are fantastic introductions to the Chinese New Year, and beautifully illustrated. You can buy The Great Race here.